Earning rewards to offset the cost of a company vehicle. If your business uses company cars for deliveries or travel, you can earn 3% rewards at gas stations, restaurants, and office supply stores, plus 5% earnings on GM parts, accessories and service at authorized GM dealers - all of which can be redeemed toward the purchase or lease of a new GM vehicle. See the full list of our favorite business credit cards. 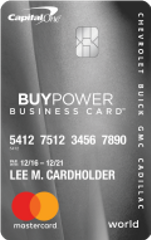 Our take: The GM BuyPower Business Card from Capital One offers rewards you can use to buy a new Chevrolet, Buick, GMC or Cadillac vehicle.